I’ve always been a fan of drinking strawberry daiquiris and lounging by the beach. 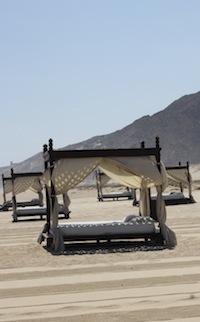 But Pueblo Bonito Pacifica takes my favorite pleasures to a whole new level. At the Pacifica, lounging by the beach is done on private beach beds and the Strawberry Daiquiris are swirled with delicious fresh mango. You can rent one of the Pacifica’s beds for $90 a day, which includes an iPod to listen to, an appetizer and a drink. 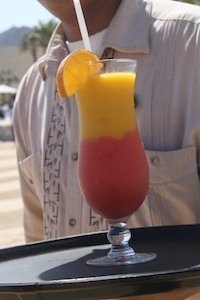 While we might not be able to lay in the beach beds forever, Rubén Ávila Galis the Food & Beverages Manager for the Pueblo Bonito Pacifica Resort & Spa was kind enough to send over the recipe for the Mango and Strawberry Daiquiri. In a blender, combine the mango, rum, orange juice crushed ice. Blend until smooth. Fill half the glass strawberry daiquiri and top it with the mango daiquiri. I hope you enjoy this delicious drink as much as I did! Have any drink recipes? Share them with us!